No wonder mums always said: “If you don’t have anything nice to say, don’t say anything at all”. 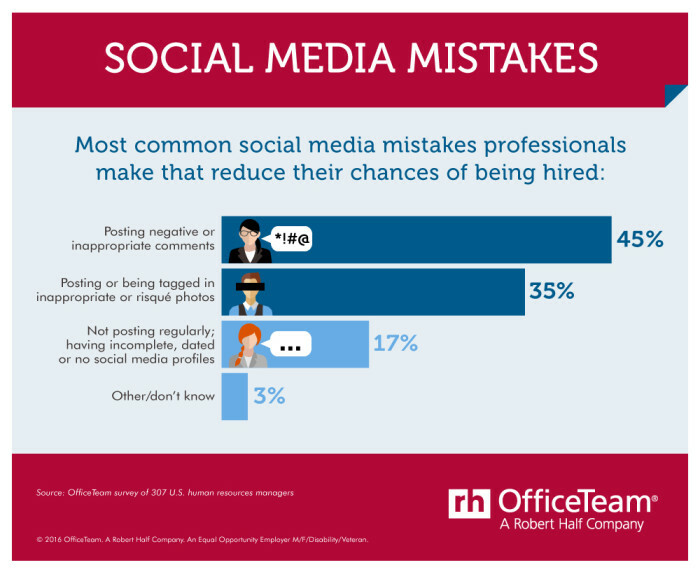 Posting something negative or inappropriate online was cited by 45% of HR managers as the most common social media mistake made by job seekers, in new research by OfficeTeam. More than one-third (35%) also listed job seekers posting or being tagged in “inappropriate or risque” photos as a major digital faux-pas. The other thing that made the list was social media inactivity – not posting regularly; having incomplete, dated or no social media profiles – as highlighted by 17% of HR managers in costing candidates a job. 1. The Cranky Critic isn’t shy about sharing off-putting remarks with the world. No subject is off limits, including former colleagues and politics. Top tip to HR: Remind them to exercise discretion when posting on social networking sites – you never know who might see your comments. 2. The Superfluous Selfie Poster has no shortage of social media photos, but they’re not exactly always office-appropriate, and there are enough of them to suggest an inflated ego. Top tip to HR: Advise them to untag themselves from any images that may raise eyebrows, and use a polished profile photograph. 3. The TMI Transgressor posts every detail when attending a party, playing a game or taking an online quiz, whether you care to know or not. Top tip to HR: Counsel them on certain topics that may make them appear unprofessional. Guide them on using their judgement when making status updates and check their privacy settings to control who in their network can access what information. 4. The Connection Counter invites just about anyone to join his or her network. When it comes to social media contacts, this person favors quantity over quality. Top tip to HR: Recommend them to be selective about who they connect with, and focus on fostering meaningful professional relationships. After all, having the right people in their network can not only help advance their career, but also activate potential employers. 5. The Nonchalant Networker takes a lackadaisical approach to social media. This individual’s online profiles are sparse, and updates are few and far between. Top tip to HR: Offer your opinion on how highlighting their work history and accomplishments can help boost their career. They can not only consider including key terms that describe their skills, but can also show an interest in their industry by participating in relevant forums.